Les maisons numériques connectées de demain devront rendre les occupants plus calmes, plus en sécurité et en meilleure santé. La révolution numérique passe aussi par l’habitat. Une rupture dans l’organisation, les modes et les styles de vie. Le Digital ouvre de nouvelles opportunités de croissance pour le monde du bâtiment, et surtout de la rénovation. Avec sa cohorte d’objets connectés, la domotique va prochainement offrir aux consommateurs un Tableau de bord de la maison connectée. Ce nouvel outil offrira aux occupants, mais aussi aux offreurs de services, un accès en temps réel à tous les états de l’habitation (humidité, fuites d’air, isolation, état des infrastructures, besoins des occupants, consommations diverses…). Préparer le marché des objets connectés du quotidien sans expérimenter en grandeur réelle, n’est pas envisageable. Leur simple cohabitation n’est pas en effet, sans poser de problème. La France se positionne parmi les pionnières du numérique, principalement grâce à des acteurs dynamiques et innovants issus du monde de l’Internet. Il leur fallait des sites d’expérimentation. Le Digital ouvre de nouvelles opportunités de croissance pour le monde du bâtiment et surtout de la rénovation. C’est une rupture dans l’organisation, les modes et les styles de vie. Les nouvelles caméras thermiques identifient les zones « froides » et « chaudes ». Elles enregistrent les rayonnements infrarouges (ondes de chaleur) émis par les corps et qui varient en fonction de leur température. Elle reproduit la chaleur emmagasinée par un corps, ou montre le flux thermique d’une paroi en raison d’un foyer se trouvant à l’arrière. Les vitres, ainsi que les parties métalliques polies, reflètent l’image thermique, tel un miroir. Les caméras se contentent de produire une image de l’intensité du rayonnement, qui permet également d’apprécier la température de la source. 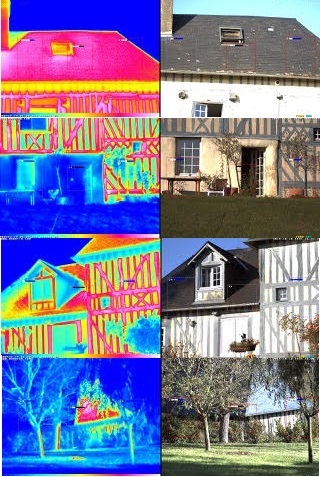 La couleur produite par la caméra est une fausse couleur, obtenue en associant une couleur à l’intensité reçue, afin de faciliter la lecture directe de la température : à chaque couleur de l’image correspond une température. 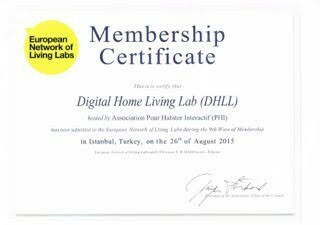 C’est le 26 août 2015 à Istanbul que la Maison Numérique Connectée Normande a été accréditée European Living Lab à Istanbul par l’organisme européen Enoll comme Digital Home Living Lab ( DHLL). DHLL devient un contributeur d’ENoll et de ses membres. Digital Home Living Lab – DHLL is a contributor to ENoLL by providing to other Living Labs our experience in the smart building sector. The french organisation – PHI 14 – envisage to host IoT experimentations coming from other ENoLL Living Labs. The French Association is interested to participate more specifically in groups working on smart cities and also on health sector (The Health Living Labs Special Interest Group). Within the francophone network of Living Labs in relation with France Living Labs and ENoLL. 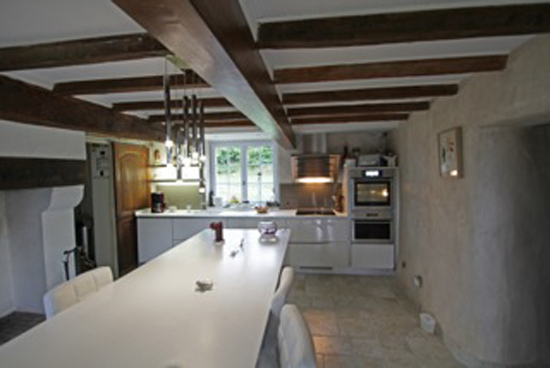 DHLL is hosted in a real house fully decorated and furnished, situated in a village in Normandy. (2 hours from Paris). The site consists of several buildings (dwelling, storage…). It spreads on about 8000 m2 of land. The property is situated 8 minutes from Pont-l’Évêque and less than 20 minutes from Trouville-Deauville. The house is an authentic norman mansion from the 18th century. It is fully equipped with technological innovative products in the fields of home automation and IoT (Internet of Things). Around 120 technical innovative @ connected products, systems and prototypes are showcased and can also be tested by consumers and installers. Following domains are covered: communication networks, intelligent heating management, remote monitoring and control of security, comfort (air quality and ambiences), control of automation (gate, locks), health surveillance, multiroom distribution of sound and images, robotics, climatology, interactive habitat, digital arts, etc. Feedbacks from experimenters about uses, friendliness, ergonomy, design are solicited so that products and devices can be constantly ameliorated in a co-design approach. The Living Lab provides truly real-life contexts for experimentations of technical systems and solutions as it is constituted by an authentic house. Thus the house itself regroups several thematic testbeds in which live scenarios can be implemented. o Integration of systems for senior people: automatic lock (Okidokeys) coupled to a motorized gate, to external lighting, to the alarm… with scenarios “I’m leaving” and “I’m coming back” suitable for elderly, disabled people, etc. o Moreover, all equipments inside the house (furniture, decoration, accessories, etc.) are real in order to achieve utmost realism. o According to the categories of users who are involved, specific sets and accessories are brought in, and specific scenarios are designed so that people feel “at home”. We intend to receive professional and end-users who will come in groups. Under our guidance, they will test products and systems presented and give feedbacks. o Around 50 technological companies specialized in home automation and Internet of Things are already members of our Living Lab. Among well-known companies: Velux, Grohe, Honeywell, GE, Bosch, Legrand, Mitsubishi Electric, Somfy, etc. o Our ecosystem also includes such actors as installers, distributors, subcontractors, architects, engineers in the building sector, sociologists, associations in the housing sector, research centers, universities, etc. o Bruno de Latour: Bruno is a recognized expert in the field of domotics (home automation) with more than 30 years of experience. For example, in 1988, he has organized, during 3 years, an important exhibition in Paris called “the House of the Future” with 57 European compagnies in La Défense. He has successfully developed activities and projects as journalist, (publisher of the first European Newsletter “Domotique News” (1988) and “Domotique Magazine” on Home automation in 1993), consultant, author, speaker, entrepreneur. Bruno is now the President of the PHI Association which manages DHLL. o Anne-Marie Sargueil: trained in social studies, Anne-Marie has always been interested by the design sector. She is the President of the Institut Français du Design since January 2014. The Institut Français du Design regularly organizes evaluation sessions in which products can be distinguished and be awarded a design label. o Eric Seulliet: an expert in innovation, co-creation, marketing, Eric is the President of La Fabrique du Futur (an ENoLL Living Lab, CEO of Discovery Innovation Lab, Vice-President of France Living Labs). DHLL is managed under the auspices of the PHI Association. As all associations it has a Bureau composed of 3 people: President (Mr Bruno de Latour), Secretary (Mr Pierre Pougnaud) and Treasurer (Mr Denis Lepeu) for conducting management and administrative tasks. A majority of exhibitors in DHLL are members of PHI 14.
o the Executive Committee (in charge of strategy): it is in charge of elaborating the strategy, of designing the different offers of DHL, of expanding DHLL in different part of France/Europe, of finding new investors and collaborations. o the Scientific Committee (an advisory board providing advices): it is composed of futurists and researchers. Its role is to prepare the future products/systems/services with a user-centric approach. Many start up participate to DHLL (e-sylife, Oledcom, etc.) and are proud to collaborate with other well-known larger corporations (Somfy, Philips, Bosch, etc.). All the DHLL participants are very satisfied to meet other actors, and by this way, to develop different services and demonstrations… Mutual collaborations through the DHLL members as lighting with security, as automation with security, as energy with automation and son on… senior economy. As an open association, PHI is open to welcome sponsors and members as long as they share same interests for connected homes.